The difference between deciding whether to use a larger, well known tax preparation company versus a smaller, independent, boutique firm where your return will be prepared by an actual IRS licensed expat tax preparer, is similar to eating fast food compared to a eating at a three star Michelin restaurant at a lesser price. The larger firm wants you to come in and sit there while the stressed out tax preparer hastily prepares your return as a queue of people waiting in the lobby continues to fill. The smaller firm is unrushed, focused and relaxed, having you supply them with your paperwork while they take their time crafting it to provide you with the best possible outcome. If you are a U.S. citizen and resident alien who work abroad or who have income earned in foreign countries then you are subjected to U.S. income tax, regardless of where you are living. Also, you are subject to the same income tax filing requirements that apply to U.S. citizens or resident aliens living in the United States. Genesis can help to file your U.S. tax return conveniently, confidently, and remotely wherever you are in the world. It’s that time of year again. US tax filing deadlines are just around the corner. Of course, sorting through all the forms can be a real headache – especially for Americans living abroad. Luckily, there’s help for the computationally challenged among us. What’s one of the most important things Americans abroad need to know about US expat taxes? The key factor that all US expats need to know is that the US uses a citizenship-based taxation system, so living abroad does not exempt you from filing a US tax return each year. You must report your worldwide income on your US expat taxes (yes, even income you earned abroad!) and you may also be required to report your foreign bank accounts and financial assets via the Foreign Bank Account Report (FBAR) or FATCA Form 8938 if you exceed the respective filing thresholds. What are the differences between FBAR and FATCA? The FATCA Form 8938 will be filed with your expat tax return and submitted to the IRS, but your FBAR will be filed with the US Treasury Department. Also, the filing threshold for Form 8938 is quite a bit higher than FBAR, as it starts out at $200,000 for US expats and goes up to $600,000, depending on your filing status. Whereas, an FBAR is required if your foreign bank accounts exceed $10,000 at any point during the tax year. What are the tax deadlines US expats need to know for 2017? In the US, while a majority of citizens are focusing on the April 18th tax deadline, US expats actually receive an automatic two-month extension until June 15th to file their taxes. There is also the option for an additional extension, making the final tax deadline October 16th. Despite the extended deadline for expats, it is important to note that any taxes owed to the IRS will still be due by April 18th, or interest will accrue until the tax bill is paid. If you’re unsure whether you’ll owe taxes, you can estimate your amount due by working with an expat tax professional or using tools on the IRS website. The deadlines for filing state taxes will vary on a state-by-state basis, so it’s important to research the requirements of your specific state in order to stay on top of the deadline. What do expats need to know about the FBAR deadline change? Historically, the FBAR always had its own deadline – June 30th following the tax year. This meant another date that US expats had to keep track of, not to mention the fact that there was absolutely no extension available – so a late FBAR meant the risk of incurring penalties. Beginning this year, though, the FBAR deadline has changed significantly. The deadline has moved up to Tax Day, which is April 18th this year. However, US expats receive an automatic two-month extension, making FBAR due the same day as expat taxes – June 15th. This change should make it easier for expats to keep track of important deadlines, since expat taxes and the FBAR now follow the same timelines. Also, there is an additional automatic extension until the October 16th deadline if you need more time to complete your FBAR. It’s worth noting that the automatic extension is in place to help Americans acclimate to the deadline change, so it’s possible it may not be offered in the future. The one difference to make note of is the fact that the FBAR is still filed with the US Treasury Department – it is not submitted with your US Tax Return. Why is the new passport revocation law a big deal for US expats? The passport revocation law, which went into effect in late 2015, allows the US State Department to revoke the passport of any US citizen owing more than $50,000 to the IRS. At first glance, that amount of tax debt may seem hard for the average person to exceed, but it’s actually quite easy for interest and penalties to accrue while living overseas as an expat! For example, failing to file FATCA Form 8938 incurs a penalty of $10,000 and increases for continued failure to file. If an expat wasn’t aware of their filing obligations for Form 8938, it’s easy to see how interest and penalties can add up quickly! That’s why it’s so important to stay on top of your tax filing and bank account reporting obligations, so you won’t have to worry about being penalized or worse, having your passport revoked. Is there anything specific US expats living in Germany should know about expat taxes? There is a high tax rate if you earn a higher income, but you can take advantage of the Foreign Earned Income Exclusion and/or the Foreign Tax Credit to reduce or eliminate your US tax liability. You’re considered a resident if you arrive with the intent of staying longer than six months. Your residency is proven by establishing a residence within Germany or having a presence in the country that indicates you’ll be staying long-term. How can Genesis Tax Consultants, LLC help US expats become and stay compliant with the IRS? We know expatriate taxes can be complicated – that’s why we strive to make the process of preparing your taxes a hassle-free experience with your own personal secure file share account and online tax organizer, making it a seamless, painless, and affordable experience. Genesis Tax Consultants, LLC aims to help expats navigate and understand the US tax system and how their individual situation is affected by IRS requirements. 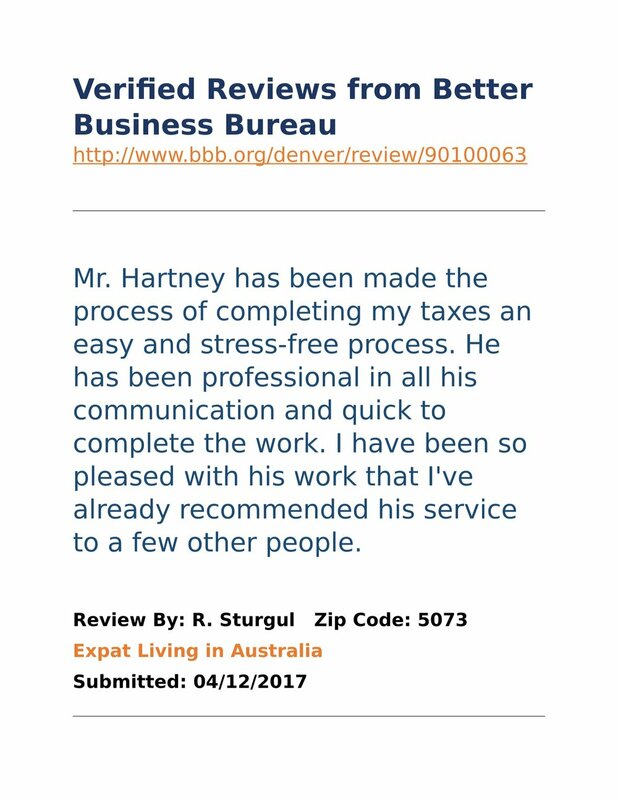 Senior Tax Consultant, Nicholas Hartney, EA, Licensed to Represent Taxpayers Before the Internal Revenue Service, is an expat himself he has first hand knowledge of understanding the challenges Americans living abroad face when it comes to their taxes. Thank you! Nicholas Hartney, EA will submit your quote shortly.